Tall Ships and kayaks in Hartlepool Marina. A charity in south east Northumberland has been awarded £777,200 to explore its ship building heritage and renovate its own tall ship. Blyth Tall Ship will use the Heritage Lottery Fund cash to restore a 100-year-old wooden tall ship from Svendborg in Denmark, that will be on show at the Quayside in Blyth. The News Post Leader revealed last week how Blyth will play host to the tall ships regatta next summer, with vessels from around the world expected for the weekend-long festival. The money will also be used to explore, through archive research and through the practical restoration of the ship, the life of merchant adventurers from the north east who changed the face of the globe. The project will train 50 young people and volunteers a year in heritage boat building skills at NVQ Level 1, 2 and 3. An educational programme is also planned and will enable 2,000 school children to take part in curriculum based activity days around the theme. Clive Gray, chief executive of Blyth Tall Ship, said: “We are all tremendously excited. 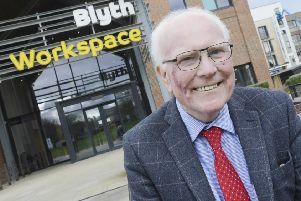 “This represents a sea change for the Blyth community and the volunteers, staff and trainees of Blyth Tall Ship. The ship, Haabet, which is being bought by the charity from Denmark, is of a similar size and design to the to the Brig Williams, a merchant vessel built in Blyth in 1813, which discovered the first land in Antarctica six years later. That vessel, skippered by local Captain William Smith, discovered the first land in Antarctica in 1819, according to the Heritage Lottery Fund. It is hoped the renovated ship will pave the way for a bicentennial celebration of the discovery in 2018 and 2019 by recreating the original voyage and re-introducing wooden shipbuilding in new workshops. Ivor Crowther, head of Heritage Lottery Fund North East, said: “We’re incredibly proud to be supporting this internationally important project which will bring the story of ship building and the lives of sea adventurers from the north east alive visitors and locals alike. The Ship will host the Tall Ship for the Tall Ship Race from Blyth in 2016 and leading on from this, the charity are planning a Heritage Boat Festival from their quayside location in 2017.